October birthstone jewelry wearers can choose between two gemstones: opal or tourmaline. The first brings to mind the flashes of lightning and fireworks. Opal has been revered throughout history as the luckiest and most magical of all gems because a rainbow of colors can appear in one stone. This gemstone was a favorite of Queen Victoria. Tourmaline, the gemstone of the rainbow, occurs in a wide range of colors. Some stones are even multi-colored. The most popular variety is pink –sometimes known as Rubellite – which is believed to promote balance and protect women. 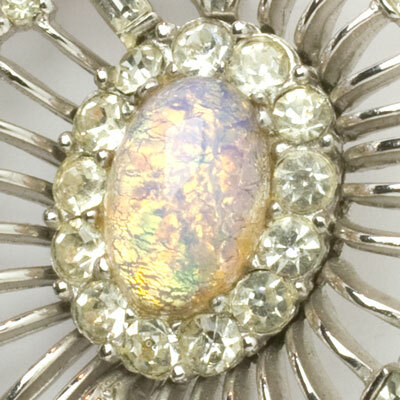 See this blog post with styling tips for wearing an opal brooch with today’s fashions. 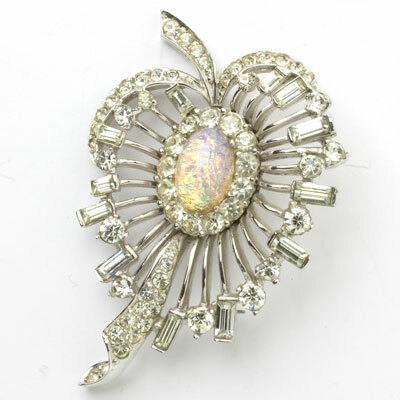 This Boucher brooch from 1950 looks like fine jewelry, with its fiery-opal art-glass center surrounded by sparkling diamanté. The setting is rhodium-plated metal with a roll-over safety clasp. Of all the Boucher pieces in this collection, I think this one is the best. How beautifully it would adorn a bridal gown! 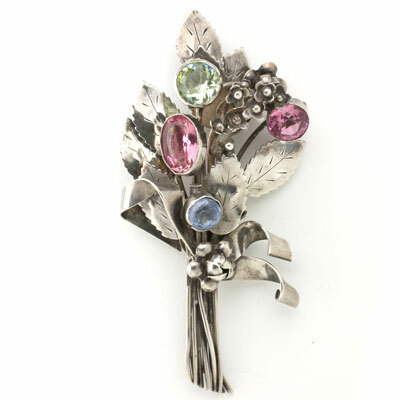 This Bogoff brooch has hot-pink-glass stones and diamanté in a rhodium-plated setting shaped like a snowflake. This piece closes with a roll-over safety clasp. The color is elegant, and the shape is timeless. Bogoff made lovely pieces in the 1950s. This pair of Hobé brooches is delicate and lovely. Each is a flower with a deep-pink tourmaline (almost fuchsia) center. The sterling petals on one side are furled; those on the other side feature a beautiful open-work design that is known as fretwork. You can wear the pair together on the shoulder of a dress or jacket, or on either side of a collar. What a lovely adornment for a bride's hair! These brooches were hand-made. Although they’re marked “DESIGN PAT’D”, I have been unable to identify a design patent that looks like them. 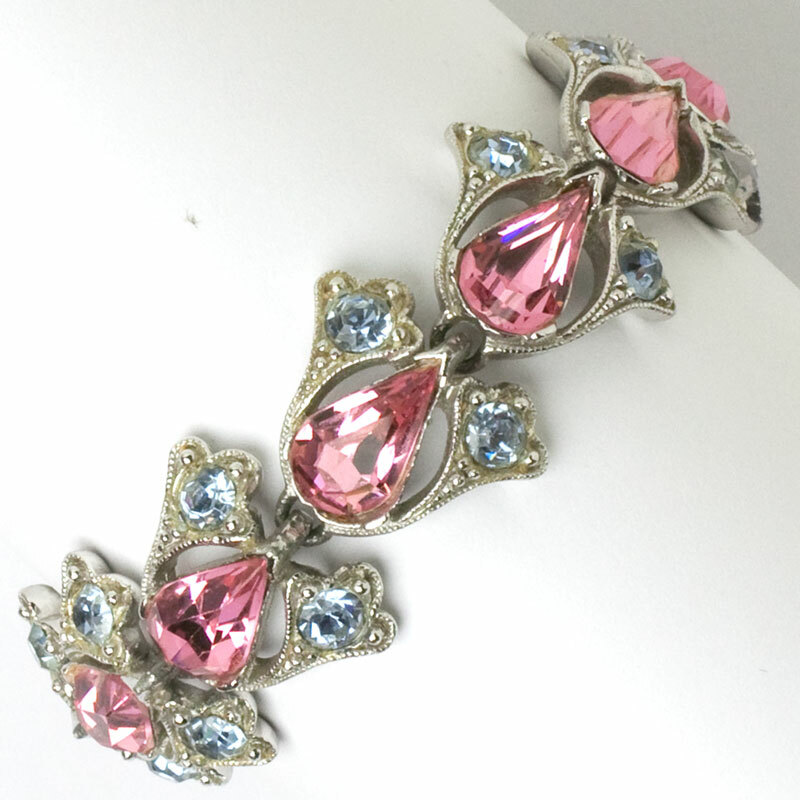 This pink tourmaline bracelet has faceted pear-shaped-glass stones mounted in decorative rhodium-plated links with round alexandrite-glass accents. These smaller stones change color from blue to purple, depending on the light. Designed by Bogoff in the 1950s, this piece closes with a concealed clasp and safety chain. A rich color combination for those who look best in cool hues. Scroll down to see the matching necklace and earrings. 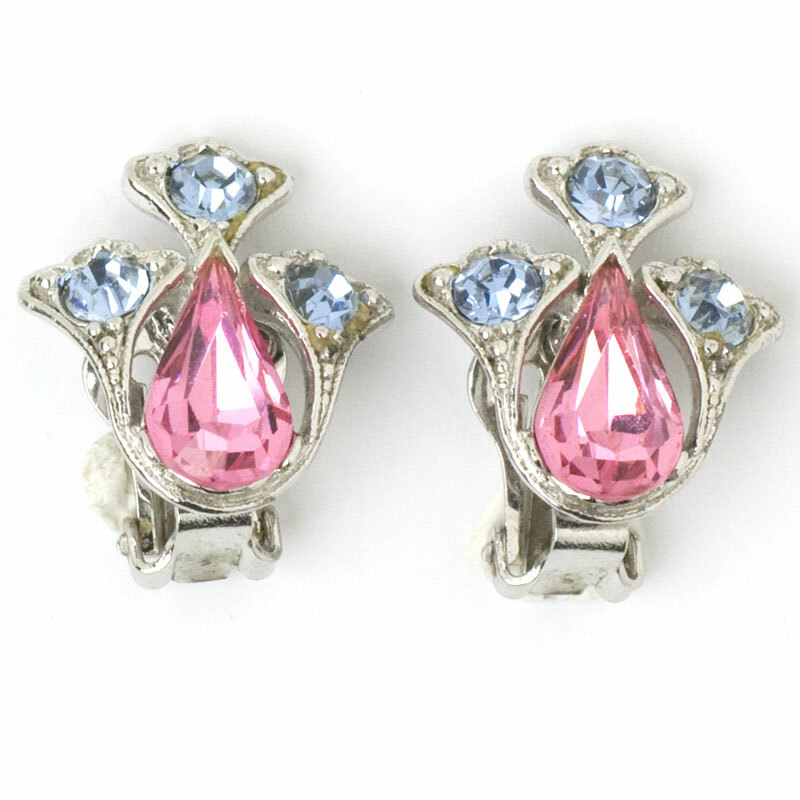 These pink tourmaline earrings were made in the 1950s by Bogoff. 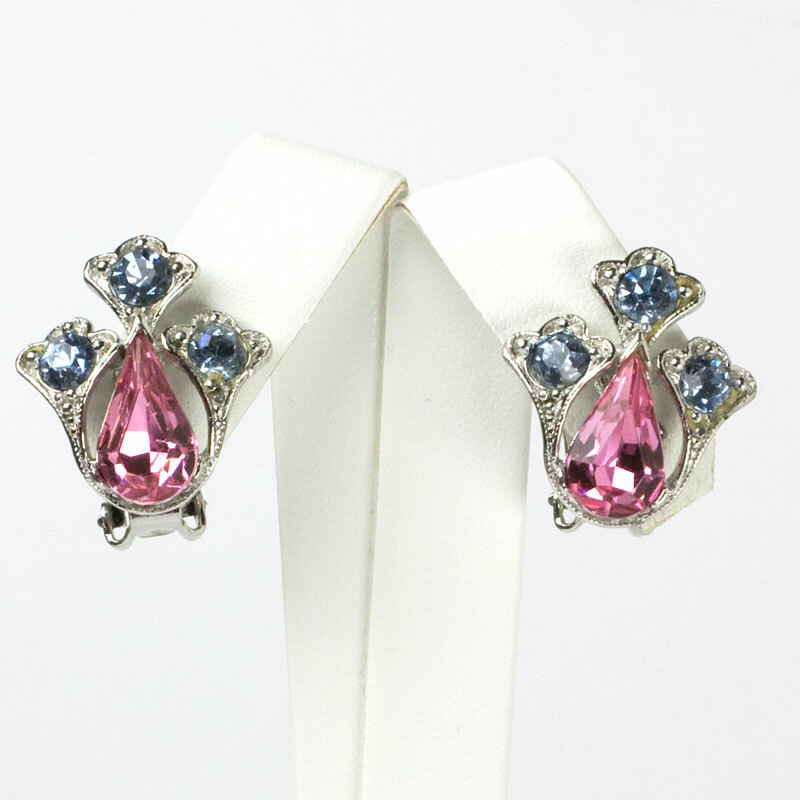 They feature a faceted pear-shaped pink-glass stone mounted in a decorative rhodium-plated setting. The main stone is crowned with a trio of round alexandrite-glass stones. They change color from purple to blue, depending on the light. These elegant ear clips are a striking color combination that’s perfect for those who look best in cool hues. Scroll down to see the matching bracelet and necklace. 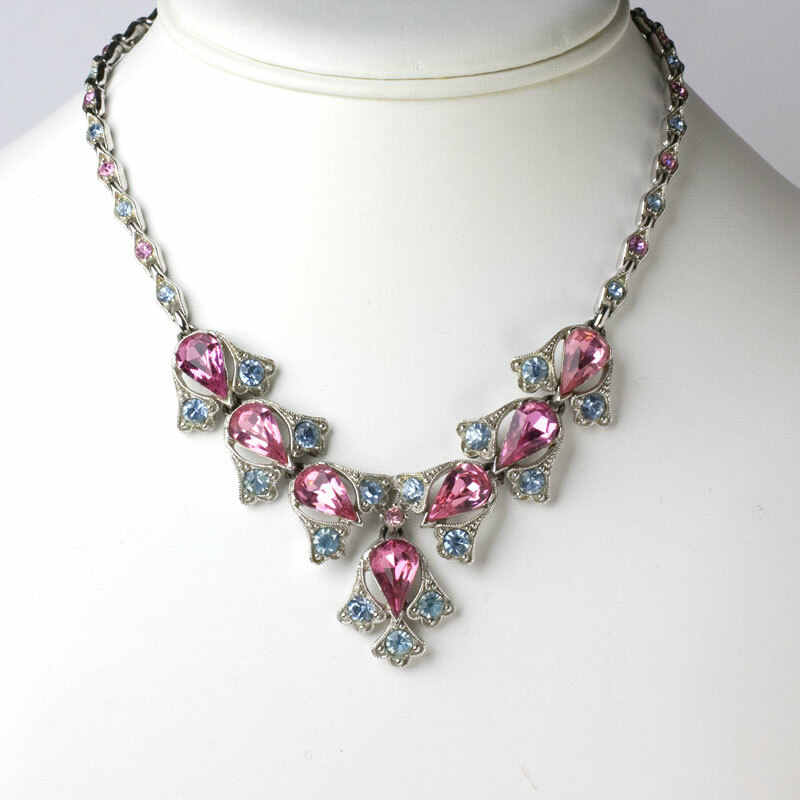 This pink tournaline necklace with alexandrite accents features a striking combination. The faceted pink glass stones are pear-shaped, while the light blue/purple ones are round. (Alexandrites change color according to the light source.) The setting is rhodium-plated. The focal point is a V-shaped centerpiece of six panels of stones, with a seventh positioned like a drop. 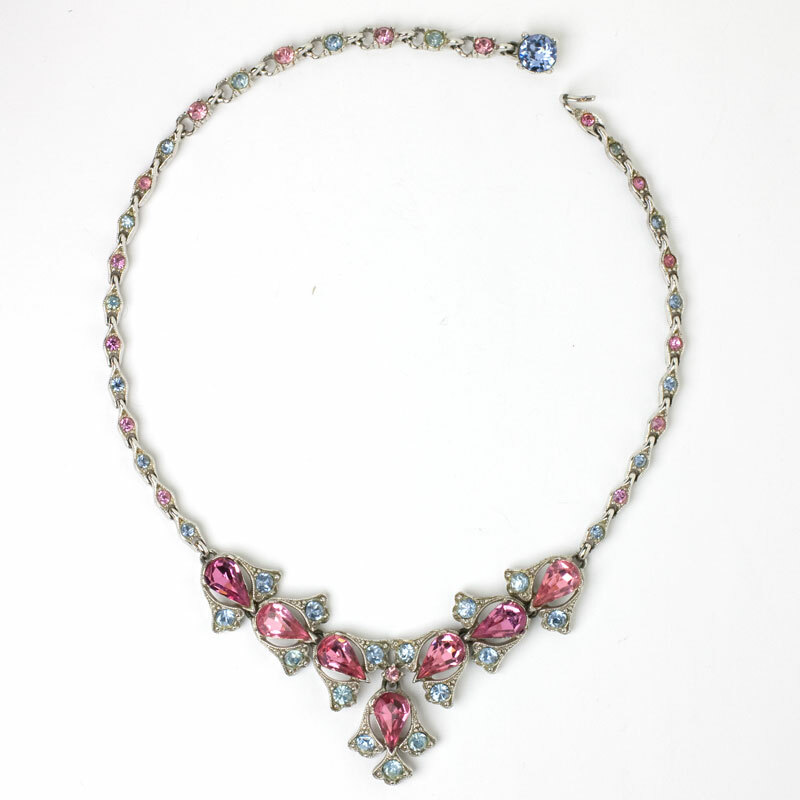 In typical Bogoff style, the chain is set with alternating pink tourmaline and alexandrite stones. 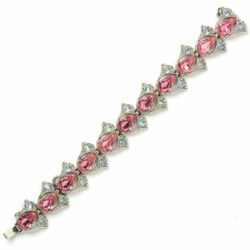 This stunning piece closes with an adjustable hook-and-tail clasp. Scroll down to see the matching bracelet and earrings. Perfect pieces for those who look best in cool colors. 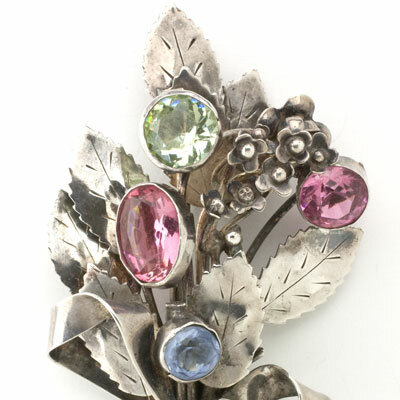 A bouquet of sterling silver flowers, stems, and leaves are tied in a bow and accented with collet-set pink tourmaline, pale sapphire and peridot glass stones. This brooch, with its roll-over safety clasp, is another example of the fine hand-made 1940s sterling silver pieces Hobé is known for. I particularly love the vertical orientation of this piece. Scroll down to see one of this maker's bracelets with a floral motif that coordinate well with this brooch.